Millions of us dread bedtime as we lay tossing and turning trying to nod off. But a new study that suggests insomnia is in our genes gives scientists new hope of a cure. After analysing the DNA of more than 85,000 people, researchers discovered 47 genetic sites which determine how easily we nod off, as well as how long we stay awake for. Of these, 36 genes had never been identified before, which could ‘inform the development of new treatments to improve our sleep’. The study was carried out by the University of Exeter and led by Dr Samuel Jones, a research fellow in the college of medicine and health. Senior author Dr Andrew Wood, a lecturer in statistical genetics, said: ‘We know getting enough sleep improves our health and wellbeing, yet we still know relatively little about the mechanisms in our bodies that influence how we sleep. 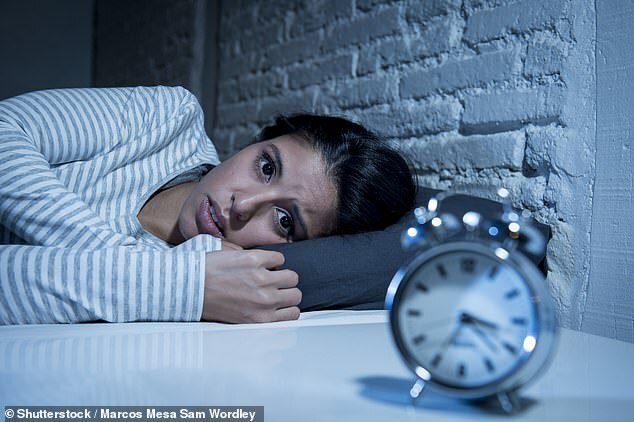 Identifying the genes behind insomnia will ‘provide new insights into the regulation of sleep’, the authors wrote in the journal Nature Communications. Although past studies have gone some way towards finding a link between sleep and genetics, they have relied on patients self-reporting their insomnia symptoms. To better this, the researchers analysed 85,670 participants of the UK Biobank study who wore accelerometers every day for a week. UK Biobank includes the genetic information of half-a-million people. These participants were compared against 5,819 people who also wore the wrist-watch devices in other trials. Accelerometers record our activity levels, which can then be used to indicate sleep patterns. This is considered a more accurate way of measuring shut-eye than self-reported data, according to the researchers. The results uncovered 47 genetic locations are associated with sleep duration, quality and timing. Of these, 26 sites related to sleep quality and ten to do with the duration of our shut eye had never been identified before. ‘Sleep-quality genes’ were associated with the production of the feel-good chemical serotonin. This neurotransmitter – which transmits chemical messages between nerve cells – has previously been linked to deep, restful slumbers. Among the newly-discovered genes was one called PDE11A, which affects both how long we sleep and its quality. PDE11A has previously been suggested as a drug target for those with neuropsychiatric disorders that affect mood or social behaviours. ‘This study identifies genetic variants influencing sleep traits and will provide new insights into the molecular role of sleep in humans,’ Dr Jones said. The results further revealed those with a larger waist are less likely to get sufficient shut eye. However, this association was very small, with those with a 100cm hip circumference getting four seconds less sleep a night for every 1cm increase in waist circumference. The study also found those who suffer from restless leg syndrome are less likely to have a good night’s sleep. Within the first 24 hours of sleep deprivation, the body’s hormone levels change, leading to a rise in blood pressure, SLATE reported. A person’s body temperature also drops and their immune system becomes compromised. It is thought the rodents’ body temperatures dropped so much they developed hypothermia.